and then spent the money on clothes. One shirt and two jackets from my favourite shop Fantasmagoria. They’re in Lithuania, and they have great prices and low shipping costs. Their sevice and speed of delivery is much better than buying from China. AND I bought a skirt from Talismana Designs on Etsy. Oh dear. Did I overspend? Well, mask making is my hobby, and the sales paid for the clothes, so I figure that’s okay. What do I do with clothes like this? I wear them. I do. I get up in the morning and dress in this kind of gear, then go to work in my office – after I’ve done my meditation and taken a walk, that is. 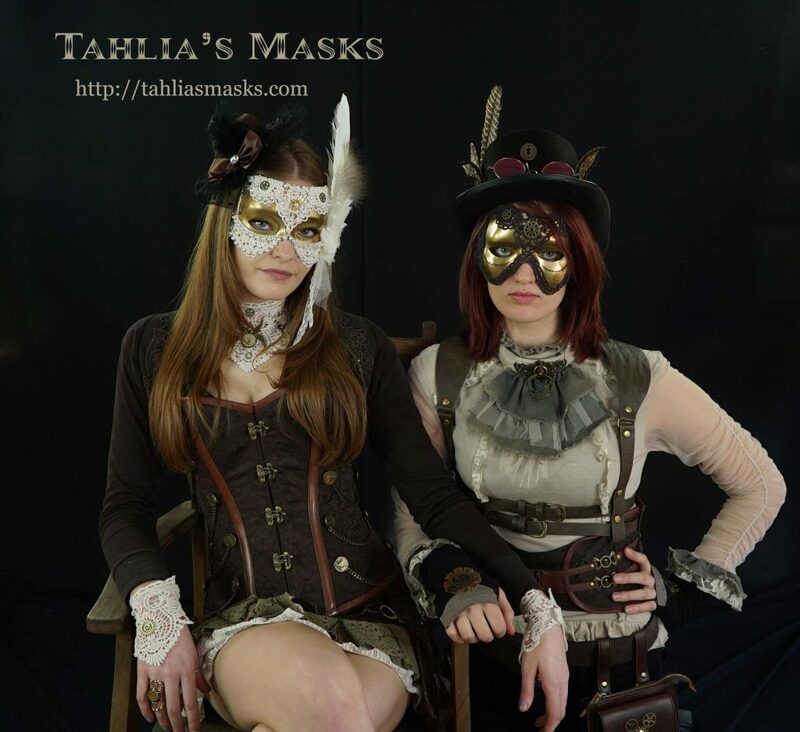 I have a bunch of posts on my Tahlia’s Masks blog on practical steampunk fashion and there are photos of me in this kind of gear. I also use them for photoshoots of my masks and steampunk accessories. These couple mask set is still available. Click here to see them. If you enjoyed this blog post don’t forget to share it with your social networks. If you’d like to read more posts like this, subscribe to new content delivered by email (see the button on the right side bar).